These outdoor tables are perfect for any patio they have frosted glass tops and sturdy metal bases. Please note: We would like to point out that all furnishings have come out of a commercial environment and may have blemishes that may not be visible in the product images. All of our items are fully tested and professionally deep cleaned by our team of specialist engineers and cleaners before going on sale. We invite you to visit our showrooms here in Warrington Cheshire, to fully inspect the items you wish to purchase. If you are some distance away from us, we can arrange for a video showing the item working and any other areas of the item you wish to highlight and we will email the video to you. We Photograph all items individually to ensure the product that you have seen will be the item you receive. Collection of products can be easily arranged, we will prepare the item for collection by wrapping the item in a protective film. 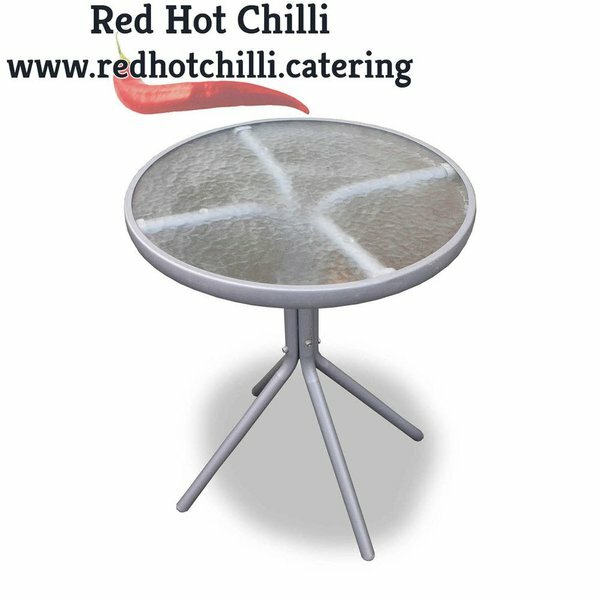 Alternatively we can provide delivery to anywhere in the UK and overseas. Over the years we have built up a quality team of trusted independent couriers that are very competitive on price.